It’s summertime, and the living is easy. Well, the heat may be putting a bit of a damper on comfortable living, and our material in our landscape is likely showing heat stress, too. No need to panic as we are here to help! If you have been following and keeping up with our blog, you probably have the best-looking landscape in the neighborhood. If it’s your first time reading our monthly landscape and garden tips, now is an excellent time to read up on our expert recommended tips. Our nursery pros have covered some important tips for taking care of our trees and other plants this summer. How to Water, What to Plant, and More! The best time to do any gardening is in the early morning or later in the day. The goal is to avoid the heat. So, do your chores when the temperatures are much more comfortable. Watering: Early risers have an advantage in the summer. We recommend watering early in the morning, between 4 am and 8 am. Watering early in the morning reduces the evaporation loss. Deep watering is the best way to ensure that the entire root zone becomes saturated. When it comes to watering trees, be sure to saturate the soil at least three feet deep and for shrubs, drench the soil at least one foot deep. We will want to deep water with a hose every ten to fourteen days. Water your containers twice a day. If you notice white crust building up in containers, it’s salt buildup; remove and water heavily to flush out salts. Keep an eye out for summer drought conditions. We recommend deep watering your flower beds and vegetable gardens two to three times a week. Fertilizing: Apply a slow-release fertilizer to containers. Feed your roses during the middle of the month to encourage more flowering. 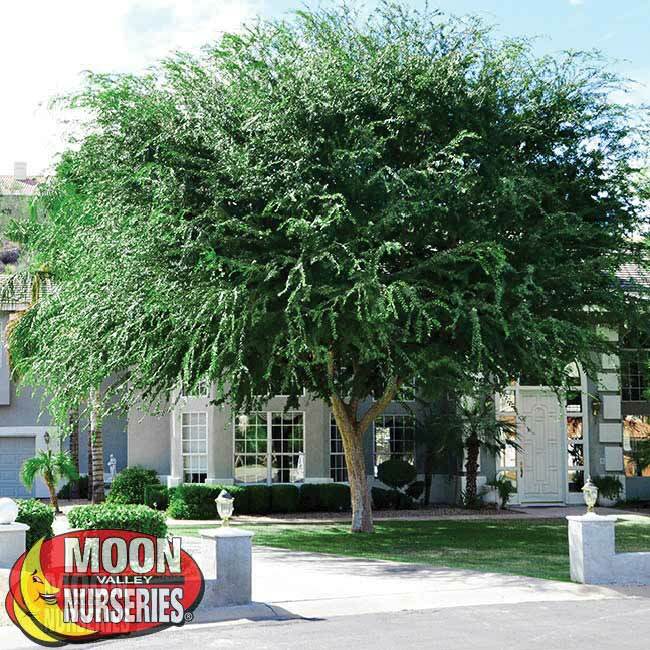 Moon Valley Nurseries has developed specialized blends of fertilizers that can give the material in your landscape a helping hand during the summer. Our fertilizers are designed to help trees, palms, and shrubs recover from any heat stress. 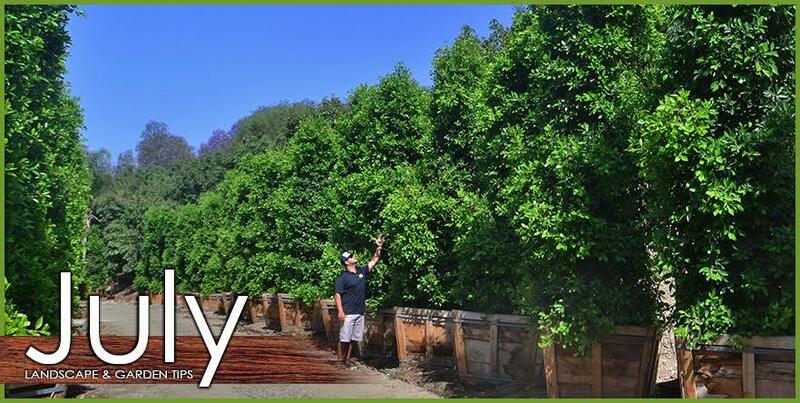 Purchase our fertilizers at all Moon Valley Nurseries locations. Protect the Trunk of Your Tree: Did you know that trees can get a sunburn, too? They can, and unlike humans, applying sunscreen is not going to benefit the tree. Young trees will need protection when the temperatures rise. We recommend protecting a new tree from sunburn with a Protective Tree Wrap. It is also smart to stake both young and older trees. Staking the trees will provide some stability when the high winds or monsoon comes in. Mulching: If you are looking to keep the soil moist all summer long, we recommend applying mulch around the base of the tree. Adding a three to four-inch layer of mulch is an excellent way to retain moisture and keep your soil cool during the summer months. We will also want to keep a thick layer of mulch around the roots of trees and shrubs. Pruning: This is the time to remove any faded or dead flowers to encourage new growth. We will want to remove annual flowers that have finished flowering. Vegetable Garden: We will want to plant transplants of tomatoes, eggplants, and peppers. This is an excellent time to start seeding lima beans, pumpkins, and squash. Tip: If you have garlic and onions, they are ready when their tops start to bend over. After they have dried for a couple of weeks, remove their tops and store in a cool place. Lawn Care: We recommend raising the mowing height to 2.5 to 3-inches. Also, water your lawn with one inch of water per week. 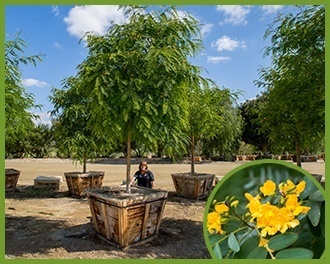 Tipu (Tipuana tipu): Anyone that is looking for a shade tree is sure to love and appreciate the amount of shade these fast-growing trees can create. These trees are a favorite throughout Arizona. They are water-wise trees that can thrive in intense desert heat. People love their year-round beauty. They feature feathery bright bluish-green foliage and put on a show when the golden blooms appear from late spring to early summer. Of course, in the summer, it’s all about the shade, where Tipuana tipu trees are star performers. Plant them as an excellent street tree or lawn tree or use them as a tree for the patio. 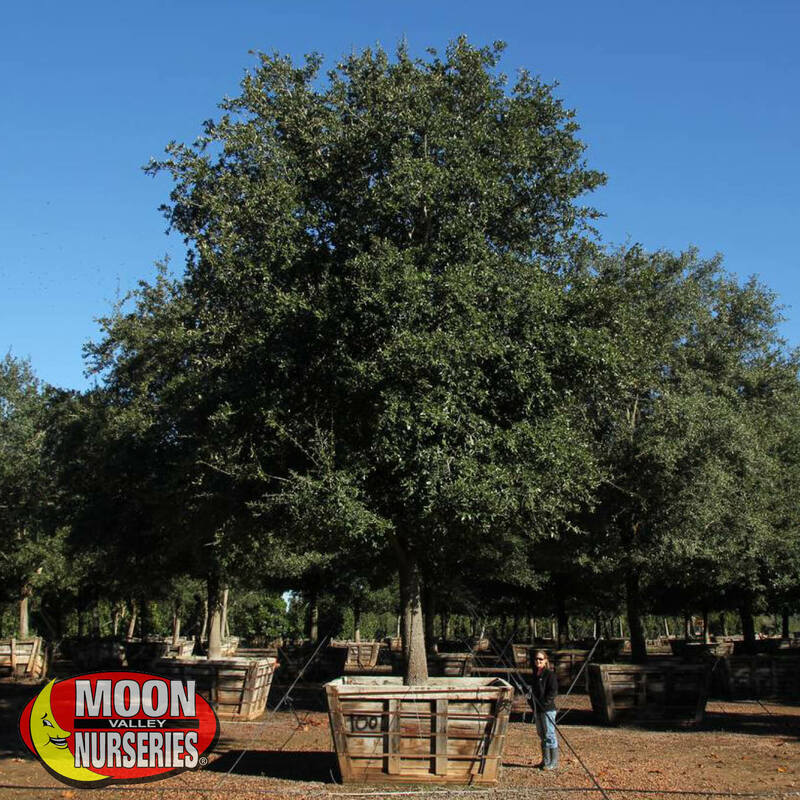 Live Oak (Quercus virginiana): These are long-lived trees with a beautiful spreading canopy that can block sunlight and create shade. Live Oak is an iconic tree that can live for hundreds of years. They are excellent trees for Arizona because they require little water once established. Homeowners rave about their low maintenance features and families are sure to love mature trees that offer plenty of climbing opportunities. If you want to create massive shade and a privacy screen, we recommend planting them in rows! 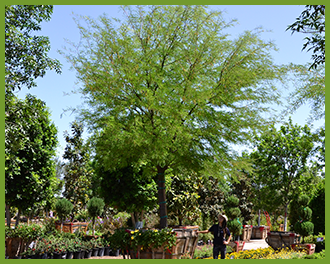 Chilean Mesquite (Prosopis chilensis): This is a thornless variety of Mesquite, and it’s one that features a wide canopy that can provide light, filtered shade to create a comfortable area outdoors. This tree is classic featuring soft, bright green, fern-like foliage and dark, twisting branches that add visual interest to any landscape. These trees are water-wise, so they are also an excellent choice for a dry rock garden, or planted near pathways and patios where the shade they create is sure to be appreciated by everyone. We recommend planting a few of them together as groves so that they can create a privacy screen complete with shade coverage. Chinese Elm ‘True Green’ (Ulmus parvifolia): Plant a Chinese Elm tree on your lawn and bask in the shade it can provide! This summertime favorite grows with a wide, umbrella shape that provides a comfortable picnic area. The canopy spreads fast so that it can provide plenty of shade, even at an early age! The foliage is a lovely, dark green color that looks exceptionally beautiful in the summer. Families are sure to love a mature True Green tree, offering the chance to climb its limbs or attach a tire swing for hours of fun. Ficus: Shade, check. Privacy features, check. Beauty, check. 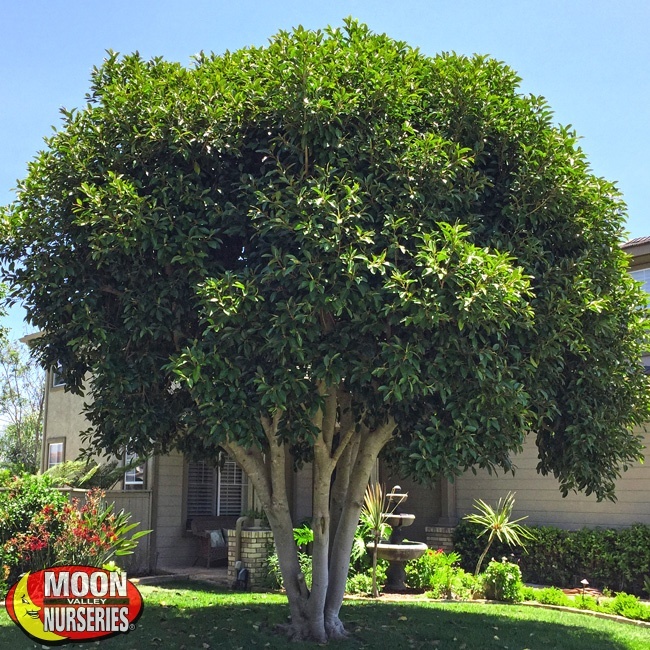 It is easy to see why this is one of our most popular trees! It features dense evergreen foliage with a wide-spreading canopy that creates the shade you need to provide relief in the summer. The dense foliage can also block unwanted views and help to create a private yard. Also, if you live near a busy street, they can act as a natural sound barrier. 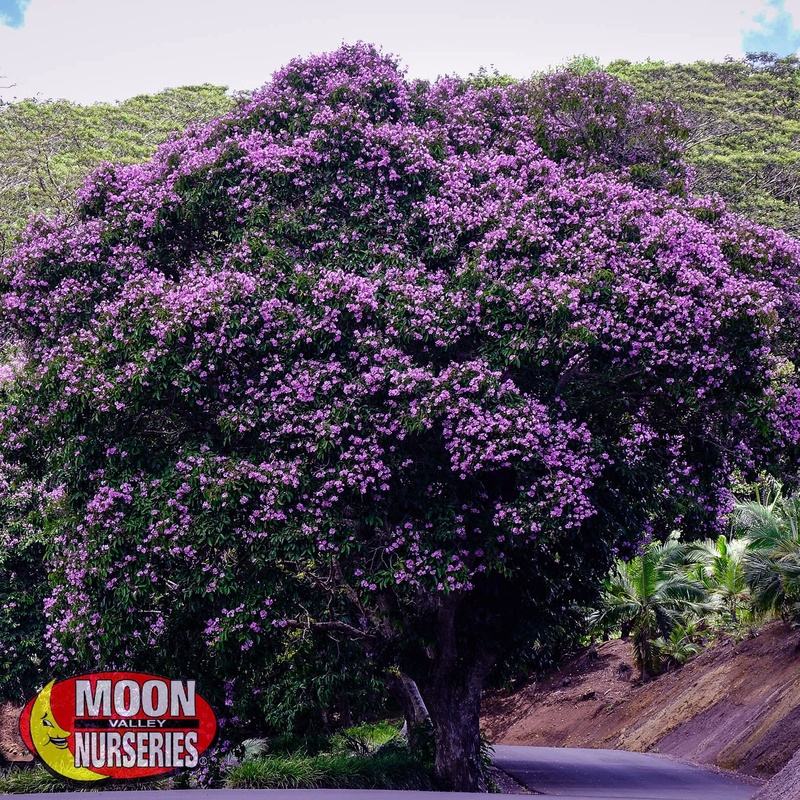 Moon Valley Nurseries offers the best varieties for our area including Indian Laurel and Rubiginosa. Crape Myrtle (Lagerstroemia): Vibrant color in your landscape can make the heat a little more bearable. These small to medium trees bloom in the summertime, creating an abundance of color that paints our landscape with a variety of hues. Summertime colors range from white to red, purple and pink. Homeowners with smaller yards will appreciate its ability to fit in tighter spaces. They are drought tolerant and are sure to add instant curb appeal. Plant them in the front yard and create drama when you highlight the tree with nighttime landscape lighting!